We all know someone who personifies chic, who is ‘elegantly and stylishly fashionable’ (as defined in the English Oxford Dictionary). These are the women who seem to have an innate ability to gently blend their personal style with the latest trends. They always look well dressed, their style compliments them perfectly and they never look out of date…yet on no occasion will you ever see them dressed head to toe in the latest fashions. They have successfully and seamlessly fused the latest trends with their own style, so much so, that you can’t tell the two apart from each other. They are, in my option, the most stylish people you will ever meet. But sadly, this ability doesn’t come naturally to the majority of us. Many of us are left baffled as to how on earth we’re going to adapt the trends to suit us and our lifestyle, and struggling to evolve. And I know that if ignored, this can very quickly turn into a downward spiral that leaves you feeling left lost and in a rut. But don’t lose hope! 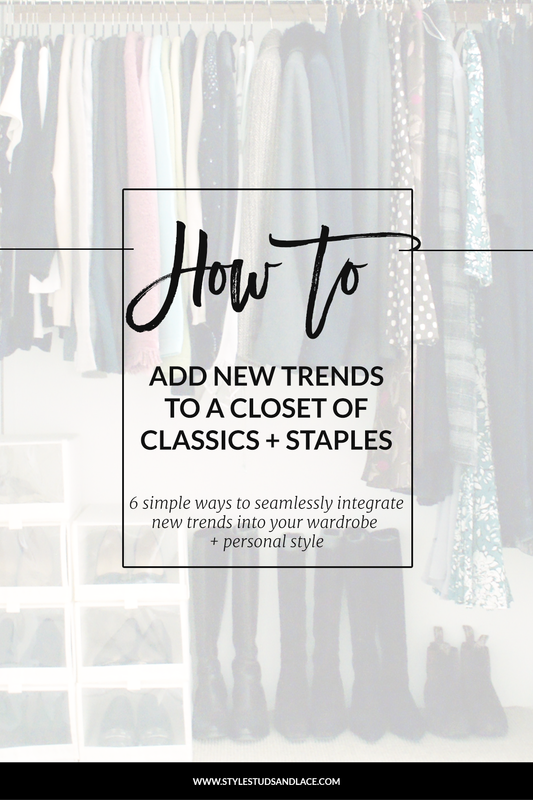 I have a ton of experience integrating the trends into looks subtly, without sacrificing style, appearance and comfort, and I’m sharing 5 of the most simple ways to so, below. WWD’s fashion trend page this is extremely comprehensive! Telegraph fashion online – Another UK site…but what can I say, I’m British so am biased! For example, if the trend for statement sleeves in bold shades piques your interest but you tend to wear a soft or muted color palette, it might be a tad intimidating going all in so opt for a more subtle version, in your usual shades instead – never let a trend define your style, take it and make it suit you. These are the items that slot seamlessly into your current collection but update it instantly. A great example of some hero pieces this season (AW2017) would be a pair of red or metallic shoes, a piece of oversized knitwear or a waist cinching belt – this is definitely one of the pieces I will be adding to my collection this winter. A simple way to update your collection is to introduce a new fabric, but in a familiar cut or style. For example, velvet is a popular fabric for aw 2017 so if you have a penchant for tailored jackets, consider purchasing a velvet jacket in a color that will compliment your collection. If you like to wear winter florals, there are some gorgeous velvet floral dresses that will update your look. Maybe you love pleated skirts? This is a beautiful updated version! Another fabric that is big for AW217 is suede, so if you’re a fan of leather, why not take a break from it and switch to suede instead – there are some beautiful suede jackets to choose from this season. The key here is to make the integration as seamless as possible to ensure that you will want to wear them, and will feel comfortable doing so. 6 / Focus on accessories. Adding a trend to your collection in the form of an accessory is the SIMPLEST way to subtly update your collection. I’ve mentioned belts and shoes already, but don’t forget about handbags and scarves. It’s important to evolve at a pace which is right for you. For some people that means completely changing their look all at once, for others, it’s baby steps. The fashion trends that come (and go) with each season offer us a fantastic opportunity to take our style in a new direction, so don’t ignore them or shy away from them. Embrace the changes and try something different, but if you’re struggling, remember that you don’t have to go it alone. I offer both online and in-person styling services that will help you to identify a style that suits you – your shape, your personality, your lifestyle and the person you want to be – and would love to help you rejuvenate your style, so get in touch!